We made a point of hitting up the @JunctionFlea last month. The biggest motivation for actually getting down to the market was that it was the last one of the season. I was duped for today's market is actually the last of the season! 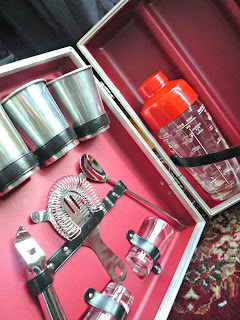 Oh well - at least I picked up this amazing travelling martini making kit. I was fondling it and discussing with my husband the merits of such a purchase (which actually blows my mind, because he is the alcoholic in the family) when another couple came up and expressed interest. I snatched it up! Don't worry - they bought the other one the vendor had so they won't be martini-less. Next year's picnics are gonna be awesome!